The story of a great and important wartime documentary that took almost 70 years to complete is explored in André Singer's powerful NIGHT WILL FALL. Slarek reviews the film, salutes the BFI DVD, and explores the issue of reframing archive imagery. actually happened. It would be a lesson to all mankind as well as to the Germans." It has been suggested that we are approaching a dangerous point in the process of learning lessons from history, one where there will soon be no living witnesses left to the suffering and horrors that mankind unleashed on itself during the First and Second World Wars. In a few years all testimonies will effectively be second hand and frustratingly non-interactive. And this element is crucial. If you've ever sat down and talked to a WW2 veteran at length (and if not, you should), then you'll know that some of the most revealing stories are told in direct response to questions, information that the individual in question may not think of otherwise volunteering. This is especially important when you're talking about what has become known as The Holocaust, a moment in history where man's inhumanity to man went beyond any definition of the pale that I can think of. Why are the witnesses to this specific event so important? Because you'd struggle to find anyone who would claim that the Second World War never actually took place, but Holocaust denial has for many years been a real and very serious issue, and as we are increasingly distanced from the event itself by time and as post-financial crisis Europe moves to the political right, it worryingly appears to be on the rise. I'm not going to sit on the fence here. As far as I'm concerned such dismissal of hard fact is the product of evil-minded, conspiracy theorist nonsense. According to the deniers, the Holocaust is nothing but Jewish propaganda, the footage and photographs shot at the camps at the time of their liberation was all faked and the testimonies of survivors all lies. It's stupidity in its most absurd and dangerous form, a refusal to accept unequivocal evidence presented on an almost epic scale because it conflicts with a chosen ideology, one that has grown out of an illogical hatred for anyone who, as Milo Tindle so neatly put in in Anthony Shaffer's Sleuth, is "not one of me." Genocide is the most obscene of all human barbarisms, and the massacre of civilians en masse because they or their ancestors were born on a different patch of ground or have chosen an alternative religion to those with the power and the guns is a sickening concept, whoever the victims and aggressors might be. But there remains something uniquely appalling about the Holocaust. It's not just the almost unimaginable scale of the killing, but the coldly mechanical manner in which it was carried out, an entire race of people reduced to the level of infected cattle to be rounded up and disposed of. Just recently I revisited the extraordinary 2001 HBO drama Conspiracy, which drew on surviving documents to recreate the meeting at which the plans for the so-called 'Final Solution' were presented and agreed on. It makes for compelling but genuinely bone-chilling viewing, not least for the speed at which the eradication of the Jewish people was proposed and approved. I have been assured by someone in the know that the length of the meeting as presented in the film corresponded almost exactly to its real-world equivalent, meaning that the extermination of eleven million people was decided in little over an hour by a small group of men over dinner. What a world we live in. I genuinely can't imagine what it must have been like to be among the first allied troops to walk into Bergen-Belsen concentration camp in Germany and be confronted by such a dreadful testament to the level to which humanity can sink. It's something whose lasting impact is powerfully communicated in the quietest of moments in André Singer's superb documentary Night Will Fall, when former war cameraman George Leonard is asked to recall what he saw. He starts to reply, then falters and finds he is unable to continue. "Sorry about this," he says as he gamely fights back tears, "Too painful." And this is 70 years after the event. Many of these cameramen were newly trained in the craft, and there was nothing in their prior experience or even modern history to adequately prepare them for what they were about to encounter. And as soldiers they were unable to turn away or break down in despair. For them, the long and traumatic job of liberating the camps was only just beginning, and part of that process involved meticulously documenting everything they saw. For the cameramen this involved going against their previous training, which required them not to dwell on battlefield injuries or the bodies of the fallen. Here they were effectively forensic photographers, instructed to film what they encountered in lingering detail so that no-one might later be able to question what had happened in the camps. Yes, the irony of that is not lost on me either. Producer Sidney Bernstein, Head of Film at the Psychological Warfare Department, visited the Bergen-Belsen camp a week after it was liberated by the British forces, and was charged with assembling the footage into a film that could be shown to the German people, many of whom were still in denial over the existence of the camps. To that end he enlisted some of the top talent at his disposal. The script was written by Richard Crossman and Colin Wills, Stewart McAllister was put in charge of an editing team that included Peter Tanner and Marcel Cohen, a certain Alfred Hitchcock flew over from Hollywood to act as advisor and co-director, and the film itself was given the coldly appropriate title, German Concentration Camps Factual Survey. Yet despite the mountain of horrifying footage that began flowing in from other liberated camps such as Auschwitz and Dachau, it would be another 69 years before the film would be completed. Night Will Fall tells the story of the shooting, editing and eventual shelving of that film, and in the process explores the experiences of those who were involved in its making, few of whom are still with us and able to provide a first-hand account. Constructed from a blend of newly filmed and archive interviews, material shot at the camps, and extracts from German Concentration Camps Factual Survey, Night Will Fall is a conventionally structured piece that frankly has no need to be otherwise. Its subject is historically significant enough not to require enhancement or visual distraction, and its narrative as compelling as any drama I've watched so far this year. The footage itself is still as shocking as it ever was, not least for the scale on which this atrocity was unleashed and the appalling condition of the bodies that remained, callously discarded and so densely packed in places that they carpet the ground. Helena Bonham-Carter provides the effectively low-key narration, and while Singer cannot resist the temptation to emphasise the horror by underscoring the footage with sinister music, it's impeccably done, the sort of low level throbbing drones that burrow into your gut and increase your sense of unease and dread. The manner in which the narrative unfolds also allows him to establish the scale and nature of the atrocity at an early stage – there can be surely few who come to the film knowing little about what took place here – and then gradually build on it, prepping you for the lingering close-ups of the horribly damaged faces and bodies of victims that he hits us with later, terrible shells of the people they once were, stripped of their humanity and then of their souls. Right, now I'm guessing this is something that will not bother many people in the least, but it's been a bugbear of mine for some time and I can't just pass it by here. Allow me to elaborate. In my younger days, when every TV in the land had a cathode ray tube and a 4:3 aspect ratio, one thing that always used to get my back up was seeing a feature film shot in scope or widescreen cropped at the sides so that the image filled the screen. Not only did this screw up the compositions of talented cinematographers, it often messed with the film's carefully constructed editing rhythm, cutting back and forth between characters who were positioned on opposite sides of a 2.35:1 frame in sequences that were originally covered in a single shot. Things improved dramatically when widescreen TVs became the norm, with 1.85:1 and even scope films being screened in their original aspect ratios. My fear was that we'd see a flipside of the original issue, with films that were shot in what used to be called the Academy Ratio – 1.37:1 or 1.33:1 – cropped at the top and bottom to fill up that big widescreen frame that now dominated living rooms across the country. To my great relief, pre-widescreen feature films tend to get screened in their original aspect ratio – at least on the major television channels – and almost never get so molested on DVD and Blu-ray. When footage that was shot 1.33:1 or thereabouts is included in a 1.78:1 framed documentary, however, all bets are off, and what I'll clumsily label Black Bar Terror too often seems to kick in, a perceived need to fill every pixel of that 16:9 screen by any means possible. Usually this involves enlarging any Academy famed footage and cropping the top and/or bottom of the picture, which results in the loss of approximately 25% of the image. Even worse is a move that I've seen a few too many times recently, even in otherwise reputable documentaries, where shots are horizontally stretched so that they fill the widescreen frame. Every time this happens I end up screaming at the screen. Seriously, do those responsible really think that if a few the archive shots have black borders on the sides then the audience is going to be filing complaints with the television company or returning their DVDs and Blu-rays as faulty goods? Then again, maybe the pressure is being applied elsewhere. When I interviewed filmmaker Franny Armstrong a few years back, the BBC had finally agreed to broadcast her excellent documentary McLibel, which despite being shot 4:3 was screened 16:9 on TV. By this point 16:9 had become the standard aspect ratio for TV broadcasts, and while the BBC were now happy to show the film (but not to fund it, eh guys? ), they were apparently stipulating that all documentary features were now expected to be in the 16:9 aspect ratio. This effectively meant that Armstrong had to go through the film and reframe every shot and reposition all of the graphics to suit this requirement. But I'm in danger of getting off subject here. Night Will Fall is framed 1.78:1. The new interview material was shot on HD and the film itself has had theatrical distribution, so this makes perfect sense. 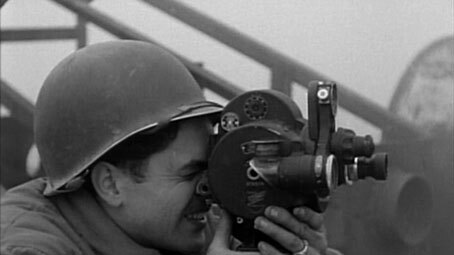 But in a film in which war cameraman and the material that they recorded is the primary focus, I would have expected the archive footage to be framed in its original 1.33:1 aspect ratio, but it has instead been cropped to fit that 16:9 frame. This bugs me for a number of reasons. As someone who has worked as a cameraman on a variety of formats and aspect ratios, I am keenly aware that even when filming the unthinkable, a camera operator frames his or her material with care, and to mess with that framing for the purpose of making it fit into a different shaped box feels somehow disrespectful, which goes against the film's own sincere championing of these people and their work. And you don't have to be a cameraman to spot when the framing of a shot has been messed with, as heads are cut in half, or part of what prompted the operator to point the camera in that direction in the first place can be detected taking place just out of frame. In the case of the footage here, this cropping also has the unfortunate but inadvertent effect of slightly censoring what we see, reducing the number of bodies in a wide shot or pushing the face of a second victim just out of a close-up. What makes this all the more frustrating is that many of the still images are not cropped to fit the frame, but presented in full with black borders at the sides. Perhaps most surprising is that the extracts from German Concentration Camps Factual Survey are windowboxed on all sides to differentiate them from the surrounding footage, but have also been cropped to 16:9. Now maybe, just maybe, the restoration team at the Imperial War Museum who completed the film were responsible for this reframing of the footage, but it strikes me as unlikely. The game seems to be up anyway when an extract from the Billy Wilder co-directed Death Mills (more on this below) is similarly cropped, as the inclusion of the complete film on this disc in its original 1.33:1 aspect ratio allows us to make a direct comparison. As I said above, for some this will not be an issue, and I appreciate that with so much of the footage being incorporated into this film, the decision was likely driven by a desire to maintain visual continuity. 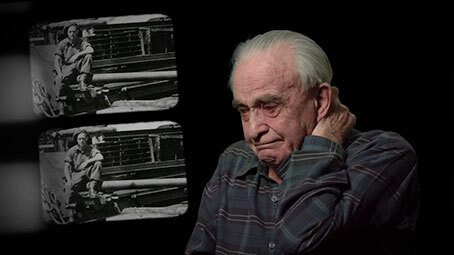 But I know I'm not alone in my dislike of seeing archive footage of any sort tampered with in this way – witness some of the comments made on Amazon about the reframing of The World at War to 16:9 for its Blu-ray release, a series whose Genocide episode was made up largely from the very footage under examination in this film. Framed 1.78:1 (well, you knew that by now) and anamorphically enhanced, the quality of this transfer is best judged by the newly filmed interview material, which is consistently first rate. 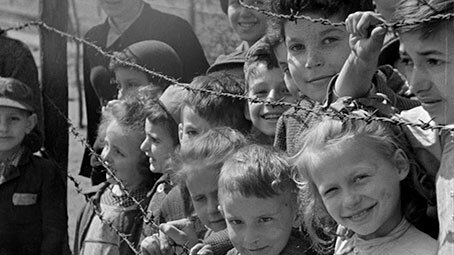 The concentration camp footage inevitably varies a little, but the best material has been impressively restored and boasts a sometimes striking level of detail for a standard definition image. Both Dolby 2.0 stereo and 5.1 surround audio tracks are available. To be honest the key difference is one of breadth – on the 5.1 track the voices are confined to the centre speaker, but are spread evenly between the main front speakers on the stereo track. The mournful orchestral score by Nicholas Singer (the director's son) sounds terrific on both tracks. Also included is an audio descriptive track and option English SDH subtitles. As if the fine presentation of the film itself were not enough to justify the asking price, a veritable treasure trove of extra features has been included, their combined length far exceeding that of the main feature. The interviews were all conducted by André Singer, perhaps for the film itself, but quite possibly with this very DVD release in mind. A solidly assembled trailer that captures the essence of the film well. Assembled under the supervision of directors Hanuš Burger and Billy Wilder after the Americans felt that the edit of German Concentration Camps Factual Survey was taking too long, this is considerably shorter than its transatlantic cousin, and according to two of the contributors to this release is a lot less effective. Not having seen the British film (yet) I'm unable to comment either way. The accompanying music and narration do give it the air of a low-key newsreel piece, but the footage itself ensures that it still packs a punch, though the brisk pace of the editing does tend to let us off the hook in the way that the lingering shots in Night Will Fall (and, apparently, Factual Survey) do not. Peppered with dust and sporting some soundtrack crackle and NTSC conversion stutter in places, it's still an important inclusion, and is correctly framed at 1.33:1. This is the English language version of a Russian film assembled from footage shot by Red Army soldiers during the liberation of Auschwitz. 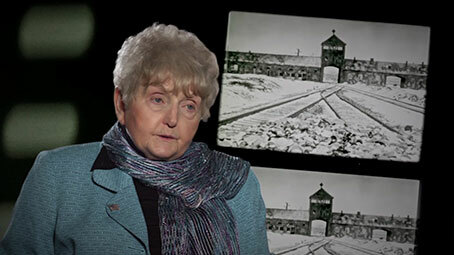 Like Death Mills, the condemnatory narration is backed by music, but the focus here is primarily on those who survived, while the scale of what took place is illustrated primarily by the items – spectacles, suitcases, human hair – that the Nazis took from their victims. Quite a bit of the footage here was also used in Death Mills, and the message comes across clearly. The fuzzy condition of much of the imagery shows just how good the restoration work on the footage used in Night Will Fall was. A short newsreel piece on the Nuremberg trials that incorporates some of the shots filmed at the camps. In what was likely a post-screening discussion, Historian Dr. Toby Haggith talks about the process of restoring and completing German Concentration Camps Factual Survey, producer Sally Engel and director André Singer cover how Night Will Fall came about and what their intentions were in making the film, and historian Professor David Cesarani talks about what's strong about the both films and what is not covered by them. Singer also states the very thing I noted at the top of this review, that we are coming to the end of an era when we are able to hear first-hand testimonies about what took place in the camps. Another useful inclusion. Historian Jeremy Hicks discusses what was unique about Auschwitz in comparison to the other Nazi concentration camps, how past Russian propaganda led to them not being believed when they reported what they found in the Majdanek camp, the technical aspects of shooting the footage at Auschwitz, shots that were reconstructed at a later date, the politics and advanced nature of Soviet editing techniques, the continuing educational importance of German Concentration Camps Factual Survey, and more. Fascinating stuff. 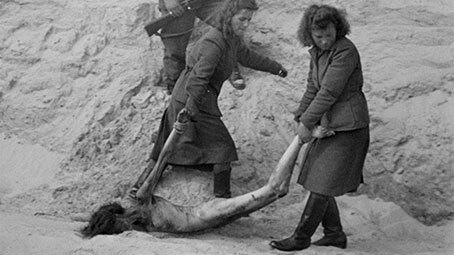 Modern European History Professor Rainer Schulze provides the sort of detailed picture of Bergen-Belsen that Dr. Jeremy Hicks delivered on Auschwitz above. After concisely covering what conditions were like within the camp, he moves on to the story of its liberation, expanding on the information provided in Night Will Fall. He also explores why the ground troops were so surprised at what they found when they arrived at Bergen-Belsen, the later role played by the film material shot at the camps, and more. How the horror of what was uncovered was reported to the British public is particularly interesting, and there's a lot on the politics of post-war Palestine. Historian David Cesarani presents the story of Buchenwald camp, which held a wide variety of prisoners, many of whom rose up against their captors shortly before the liberation. Like his fellow historians above, Cesarani is a knowledgeable and passionate communicator, and he talks about life within the camp, its liberation and the aftermath in compelling detail. 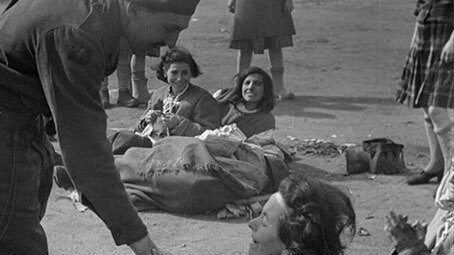 The sticky politics of post-war Palestine and how it affected British propaganda are also explored here, as are the problems Sidney Bernstein had completing German Concentration Camps Factual Survey, and why it remains an important film. Once again, a fine and informative inclusion. Writer Caroline Moorehead talks about the process of researching her biography of Sidney Bernstein, and recalls Bernstein's determination to make Factual Survey and his frustration at problems he faced in getting the film finished. A rolling collection of production stills for the main feature and supporting interviews, set to music from the film. If your hunger for information still hasn't been satiated by the time you've finished with the above, then the 32-page booklet that comes with this release should do the trick. An appreciation of the film by Sight & Sound editor Nick James is followed by an essay on the process of assembling the film by director André Singer, a producer's perspective on the production by Sally Angel, a detailed article on the importance of German Concentration Camps Factual Survey by Toby Haggith, a biographical piece on editor Stewart McAllister by Patrick Russell, full credits for the film, and main credits for all of the extra features. An excellent documentary on a wonderfully comprehensive DVD. My irritation at the cropping of the archive and camp material will not be shared by all, but repeatedly being aware that I was not seeing the footage as it was shot did interfere with my full appreciation of the film. Of course, one of things Night Will Fall does well make you want to see German Concentration Camps Factual Survey in its entirety and its original aspect ratio. A possible future BFI DVD release, perhaps? Despite my technical gripe, you still need to see Singer's film and to own this DVD, and to show it to everyone you know. Highly recommended.